Speaking of feedback, one investor wrote us that the Twitterati â€” and PETITION to a lesser extent â€” had the Sycamore/Staples story all wrong. The dividend recapitalization doesnâ€™t affect the retail story one way or another. That is because Sycamore did, in fact, separate the Staples business into multiple businesses, with the debt remaining at the Staples North American Delivery (â€œNADâ€�) entity. Staples U.S. Retail and Staples Canada Retail, as the other two units are now called, arenâ€™t on the hook for the billions of dollars of debt. And, so, other than a bitchinâ€™ new logo, Staples Retail isnâ€™t really the story. * Once again, Sycamore is. 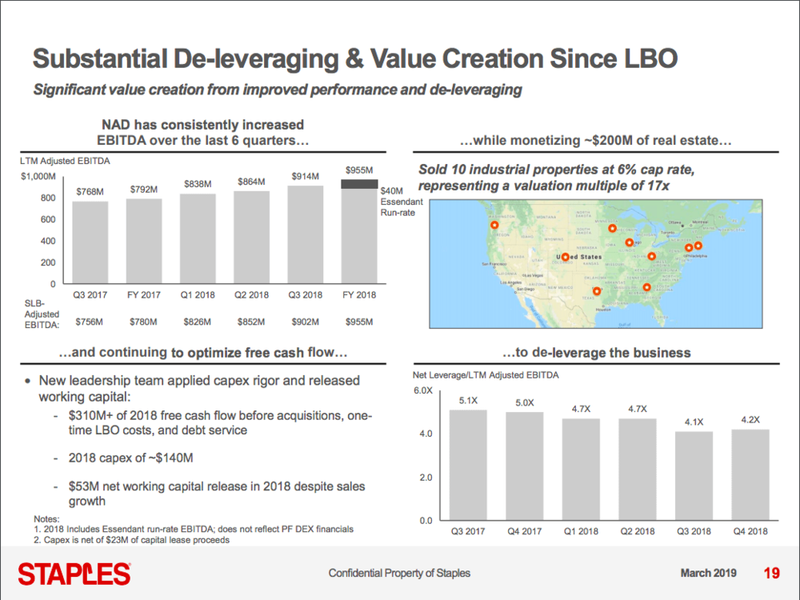 The Staples NAD lender presentation is an enlightening (and somewhat propagandist) look at the fast, furious and savage nature of the private equity model. In less than two years, Sycamore has (i) completed its intended business separation, (ii) improved EBITDA by $160mm â€œthrough stable top-line performance, expanded merchandise margins, and SG&A reductions, (iii) identified an additional $185mm of additional cost opportunities beyond 2019, (iv) bolted on some acquisitions, and (v) recruited 8 new members of the senior leadership team. Adjusted EBITDA is $1.2b (providing for certain acquisition-related addbacks). How the hell did Sycamore achieve all of this? In part, by squeezing. The company has increased merchandise margins through â€œvendor negotiations.â€� Eat it vendors! Private equity is in the HOUSE!! The company reduced fiscal year â€˜18 SG&A by over $100mm â€œthrough restructuring initiatives.â€� Eat it employees!! Private equity is in the HOUSE!! 900 of you can pack yoâ€™ bags!! And hey you. Yeah you. Sales force employee #901 who thinks sheâ€™s safe. Well, newsflash: youâ€™re not. Sycamore predicts another $19mm in sales force savings in 2019. Sycamore has another 70 full-time employees in the IT department slated for termination to the tune of $6mm in headcount savings. How? â€œOrder management system consolidation.â€� Read: tech is replacing humans. Another $20mm of savings will come from robotics within Staplesâ€™ facilities. And yet another $10mm will come from outsourcing support from internal to low cost contractors (PETITION Note: short the US; long India). When talking heads say that PE strips out costs like a bawse, theyâ€™re not kidding. Is this dude on payroll? NAD has fiercely competed to retain revenue and promote existing customer growth. Staples NAD now purportedly has ~2x as much revenue as Office Depot and ~3-4x more than Amazon Inc. ($AMZN). These guys sell a f*ck ton of office supplies, ink/toner and paper â€” about $5b worth. Thatâ€™s insane. And theyâ€™re getting after the private label space, where the company has margins over 50%. These guys arenâ€™t messing around. These guys did their thing and now theyâ€™ve got an eye towards an IPO or a sponsor-to-sponsor transaction. And then it â€” and its 4.5x net debt ratio â€” will be someone elseâ€™s problem potentially heading into a downturn. There is no coincidence here from a timing perspective. Vicious. Well, the market reaction wasâ€¦uhâ€¦interesting. Rather than issue $3.25b of senior secured term loans, the company will complete a $2.3b term loan, splitting the rest of the capital structure between secured ($2b) and unsecured notes ($1b). And the company did have to upsize the secured note piece relative to the unsecured piece. While the yield on the secured bit was mildly tighter than anticipated, the yield on the unsecured piece priced slightly wider than initially expected, indicating that the appetite for the unsecured notes was cautious â€” even at nearly 11% yield. Looks like certain investors didnâ€™t buy in to the propaganda. Or Sycamoreâ€™s reputation precedes it. Either way, Sycamore reportedly took down 18% of the unsecured allotment and apparently agreed not to trade the notes for several months to help push the deal through. That said, will Sycamoreâ€™s dividend get paid? Well, duh, of course. The marketâ€™s reaction to the issuance has no bearing on that whatsoever. Which is not to say the reaction isnâ€™t telling â€” especially when the paper immediately trades lower as it did here. Short Sycamoreâ€™s scraps.